“Motivation Matters: How New Research Can Help Teachers Boost Student Engagement” aims to help educators and policymakers understand the complex topic of student motivation. 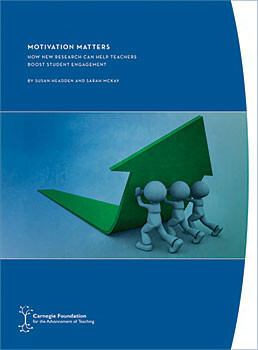 Authors Susan Headden and Sarah McKay define key terms, discuss new research findings, and examine promising classroom strategies for improving students’ engagement in learning. The report is organized according to three major factors that contribute to student motivation: rewards and value, academic mindsets, and school-based relationships. It also explores the structural supports—measurement systems, teacher training, and the translation of research into practice—necessary for the scaling and long-term success of this work.